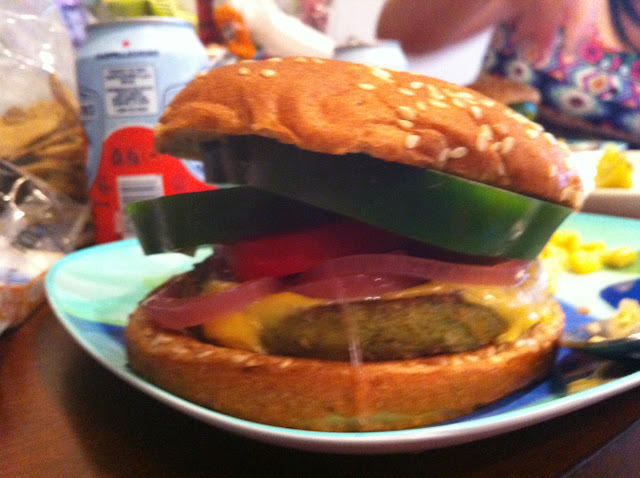 Okay, we've got a honey wheat bun smeared with Sierra Nevada Porter Spicy Brown Porter Mustard, a Dr. Praeger's veggie burger patty, a melted Kraft American cheese single, homemade pickled red onion, roma tomato slices, and hulking green bell pepper slices. This was nearly a hit. What do we know? What have we learned in our quest to make a legitimate veggie burger (or legitimize the veggie burger)? We know we've got some winners here, with thick slabs of bell pepper that provide a fresh, delightful crunch, and the amazing pickled onions. Wherever this mission goes from here, these two ingredients will be along for the ride. The fake cheese is not a good match, but it does create a peculiar, real-burgerish bite. But it's guilt by association; it makes you feel like you're eating some garbage when you're not. Lesson learned. Let's keep moving.